We’re Wild About ‘Wonders of Water’: Come See PWD at the Flower Show! Over here at the Philadelphia Water Department, there’s no shortage of people who proudly wear the “water geek” badge, and we’ve also got more than a few proponents of all things green and growing. So, you can imagine our delight after learning that the theme of the 2018 Philadelphia Flower Show would be Wonders of Water. After all, PWD has been a wonder of the water world from the beginning: our Fairmount Water Works drinking water plant—surrounded by famous gardens with fountains and sculpture—drew curious visitors like Charles Dickens and Mark Twain from around the globe in the 1800s. Now that the show’s final weekend is upon us, we can say that Wonders of Water has more than lived up to our nerdiest H2O dreams and grandest go-green expectations. Whether it’s the lush rainforest spilling over with waterfalls or the far-out landscape of giant cacti showcasing flowers that thrive with almost no water at all, each exhibit is an exquisite exploration of the liquid that makes all plant life on Earth possible. We got so excited for this year’s water theme, we even created an exhibit for visitors to explore—Home Green Home. 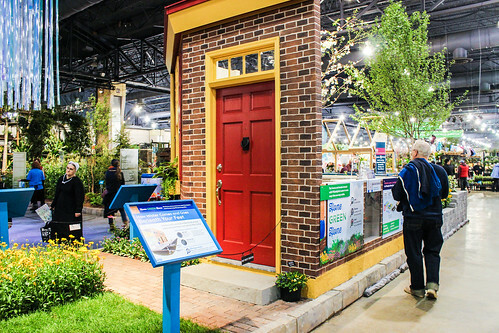 It’s a slice of a Philadelphia block transplanted to the Convention Center floor to showcase all the ways in which a local home interacts with water, from a bright flower-filled stormwater bumpout on the curb to the hidden pipes bringing drinking water to the tap and taking used water away. There’s lots of signage to provide inside info and each point of interest in the display has a tip to help you protect water, so be sure to stop by and say hello if you’re coming—as long as supplies last, we’ll have Coreopsis seed packets to encourage natural stormwater gardens at home. PWD will also have iPads where you can share your thoughts about drinking water quality. The show runs through Sunday, March 11 and is at the Pennsylvania Convention Center, 12th and Arch Streets. PWD’s Home Green Home is located just to the right of the PHS Shop beyond the Grand Exhibit. If you come in through the Marriot gates above the Jefferson Station entrance at 11th and Market, look for a fun cut-out prop where you can pose as Water Woman, PWD’s trash and pollution fighting hydration superhero. Of course, Home Green Home is not the only cool place to learn about local water issues at the Philadelphia Flower Show: look for more great stuff like Window on the Watershed, a big installation created through the William Penn Foundation’s Delaware River Watershed Initiative and the Alliance for Watershed Education. There’s also Down the Drain, showcasing landscaping options—many of which you can get funding for through our Rain Check program—that you can use to manage stormwater and make your home more beautiful. This look at select countries that don’t have access to clean drinking water brings awareness to how precious clean drinking water is and how scarce access is for most people in the world. Countries are represented by intricate designs inspired by beautiful flowers. In a world where our homes often encroach on nature, we need to find ways to make more sustainable choices. Whether we create more permeable surfaces, harvest and utilize rainwater, or make smarter plant choices, every action is a step towards building a more natural environment in an urban setting. This exhibit has been designed to highlight the connection between watershed protection and our precious drinking water resources. In addition to instilling beauty, the conservation and enhancement of aquatic ecosystems in our own gardens promotes clean and healthy water, while serving as a sustainable landscaping practice. sus·tain·a·bil·i·ty səˌstānəˈbilədē depicts an urban residence with a landscape that is beautiful as well as sustainable. Features of this landscape include the use of rainwater collected in downspouts and rain barrels for plant irrigation and fountain sculptures. Solar panels are incorporated into a green roof gazebo and many novel planters are made from recycled materials. Diverse plants are displayed in the many micro-environments of this landscape from its rain gardens and hydroponic planters to its exposed roof surface. The seniors in Williamson College of the Trades Horticulture Program and the scientists at the Stroud Water Research Center hope you are inspired by this exhibit and learn the importance of small streams in the environment. In this exhibit, we display some of the best management practices for improving water and habitat quality in small streams, which is where pollutants typically enter the waterway. Forest buffers on streambanks keep pollutants from entering streams and provide leaves as food and shade to keep streams cool. The exhibit shows how riparian buffers play a critical role in improving water quality, providing aquatic and wildlife habitats for many species. The arrival of chilly nights means it's time to make sure your pipes are protected from cold winter temps that can cause frozen or burst pipes in your home or on your property. If you don’t have water during extreme cold, check your pipes before calling our hotline. Many customers mistakenly assume a water main is broken when their home’s pipes freeze and spend valuable time on the phone. Unfortunately, we cannot thaw your frozen pipes. You may have to wait for the line to thaw or call a plumber. However, if you take the proper precautions and winterize your house, you will likely be able to keep your pipes inside from freezing. Our Cold Weather Tips quick-facts also provide info for dealing with frozen plumbing. If you're sure your pipes aren't frozen and there's no water on your block/in your home, call our hotline at (215) 685-6300. FALL TIP: Don't let the cold sneak up on you! The first night of very cold temperatures can catch people off guard, and that can leave garden hoses or outside faucets that have been left on vulnerable to freezing and bursting. Often more than a headache and trip to the hardware store for new hose, these mishaps can cause real damage if the water continues to flow after the hose, hose bib or faucet breaks under pressure. Avoid the risk: Just find the valve or handle that connects your inside plumbing to the outside faucet. It should be close to the spot on your wall where the outside water is accessible. Watch and share our video on preventing frozen pipes! With the National Weather Service calling for a blast of Arctic air that will drop Philadelphia temperatures into the teens by Thursday night, the City of Philadelphia is putting out a Code Blue alert. In addition to keeping an eye out for those left vulnerable by the extreme cold, Philly residents should take steps to protect their home plumbing from below-freezing temperatures. Philadelphia Water works hard to make sure the water we deliver tops all safety standards. Now, we're expanding our efforts to educate customers about lead plumbing and helping customers replace their lead pipes. Credit: Philadelphia Water. Today, Philadelphia Water let City Council know about robust new efforts to educate customers about plumbing made from lead and announced new, unprecedented efforts that will help our customers get rid of their lead pipes once and for all. Philadelphia Water Commissioner Debra A. McCarty answered questions and provided detailed information about our history of providing safe water, how we test for lead at customer’s taps, and new efforts to take lead pipes out of homes that will make Philadelphia a national leader on this issue. We can't say it enough: Green City, Clean Waters represents a major shift in the way we think about and do infrastructure. That means the tools we use to effectively manage stormwater—collectively called Green Stormwater Infrastructure or GSI—look and work differently than the traditional pipes and sewers people are used to seeing. One big difference is that these green tools have a much more noticeable presence in neighborhoods because they use things like trees, grasses, soil and stones on the surface to slow down water from storms that can overwhelm our sewers. In addition to managing stormwater, these green tools are also designed to have the same community benefits we get from having beautiful parks and gardens in our neighborhoods; in many cases, a stormwater tree trench or a rain garden can look pretty much just like your everyday street tree or landscaped garden. That tendency to blend in can be misleading though, because GSI can be sort of like an iceberg: we see the green tip of it on the sidewalk, in a park or on the street, but the bulk of the infrastructure is spread out over a large area underground. A diagram of a typical street tree designed by Philadelphia Water. Because GSI is a relatively new concept, even plumbers and construction contractors aren't always aware of its presence or don't realize how much is going on below the surface. That can lead to costly mistakes that could damage Green City, Clean Waters infrastructure and hurt a neighborhood's ability to manage stormwater. If you are involved with a community group that hosts zoning meetings or have other interactions with developers in your community, please feel free to share this helpful FAQ with them, especially if you know a project could impact nearby green infrastructure. With Green City, Clean Waters set to increase its footprint dramatically over the next two decades, it's more important than ever for the development community to understand how green tools work so we can all meet the goal of improving our water quality!